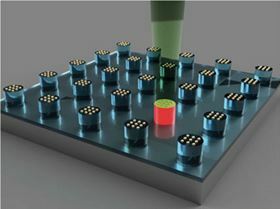 An artist’s illustration of laser-induced heating of nanoparticles on micropillars to find a catalyst for carbon nanotube growth. Image: Northwestern University. Identifying the best material for a given application, whether catalysts, light-harvesting structures, biodiagnostic labels, pharmaceuticals or electronic devices, is traditionally a slow and daunting task. The options are nearly infinite, particularly at the nanoscale, where material properties – optical, structural, electrical, mechanical and chemical – can significantly change, even for a fixed composition. Now, a new paper in the Proceedings of the National Academy of Sciences highlights the efficacy of a potentially revolutionary new tool developed at Northwestern University for rapidly testing millions (even billions) of nanoparticles to determine which is best for a specific application. "When utilizing traditional methods to identify new materials, we have barely scratched the surface of what is possible," said Northwestern's Chad Mirkin, the study's corresponding author and a world leader in nanotechnology research and its applications. "This research provides proof-of-concept – that this powerful approach to discovery science works." The libraries are created using Mirkin's Polymer Pen Lithography (PPL) technique, which relies on arrays (sets of data elements) with hundreds of thousands of pyramidal tips to deposit individual polymer ‘dots’ of various sizes and compositions, each loaded with different metal salts of interest, onto a surface. Once heated, these dots are reduced to metal atoms that form a single nanoparticle of fixed composition and size. "By going small, we create two advantages in high throughput materials discovery," said Mirkin, professor of chemistry, chemical and biological engineering, biomedical engineering, and materials science and engineering, and executive director of Northwestern's International Institute for Nanotechnology (IIN). "First, we can pack millions of features into square-centimeter areas, creating a path for making the largest and most complex libraries, to date. Second, by working at the sub-100nm-length scale, size can become a library parameter, and much of the action, for example in the field of catalysis, is on this length scale." The new study is a partnership between Northwestern's IIN and the US Air Force Research Laboratory, as part of the US Air Force Center of Excellence for Advanced Bioprogrammable Nanomaterials at Northwestern. The team utilized a megalibrary and an in situ Raman spectroscopy-based screening technique called ARES to identify Au3Cu (a gold-copper material) as a new catalyst for synthesizing single-walled carbon nanotubes. Carbon nanotubes are light, flexible and stronger-than-steel molecules used for energy storage and drug delivery and as property-enhancing additives for many plastic materials. The screening process for the novel catalyst took less than one week to complete and is thousands of times faster than conventional screening methods. "We were able to rapidly zero in on an optimal composition that produced the highest nanotube yield much faster than using conventional methods," said Northwestern’s Benji Maruyama, a study co-author. "The findings suggest we may have the ultimate discovery tool – a potential game changer in materials discovery."